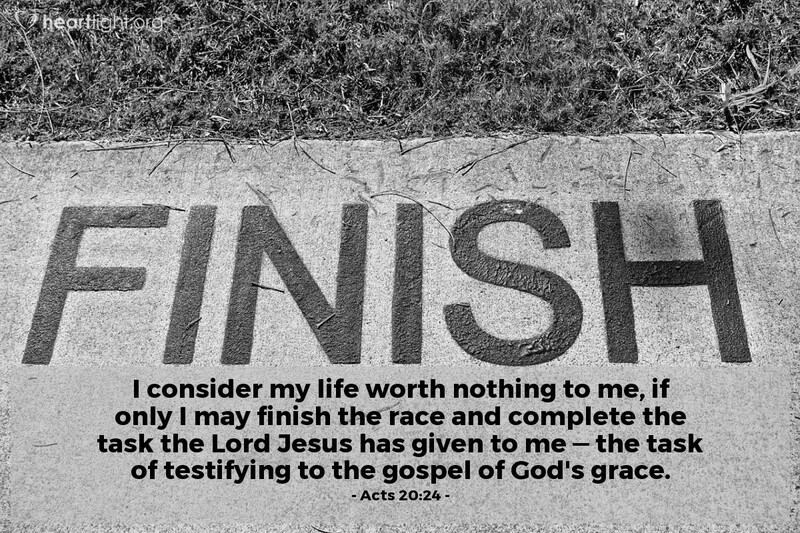 I consider my life worth nothing to me, if only I may finish the race and complete the task the Lord Jesus has given to me — the task of testifying to the gospel of God's grace. How important is grace? Paul said that God's grace and telling others about that grace were more important than his own life! In fact, sharing God's grace with others no matter the cost was Paul's life! Almighty God, Holy Father, thank you for your lavish grace demonstrated and fully expressed in sending Jesus to die for me. As your child, and in thanks to your sacrificial gift, I pledge to you my life, my love, and my all. Through Jesus. Amen.